(1953) Canter’s Deli, Hollywood | Remains of L.A. I needed to get lunch before going babysitting, and it was noon on a Sunday in Hollywood, and I wanted a bagel, so I went to Canter’s Deli. 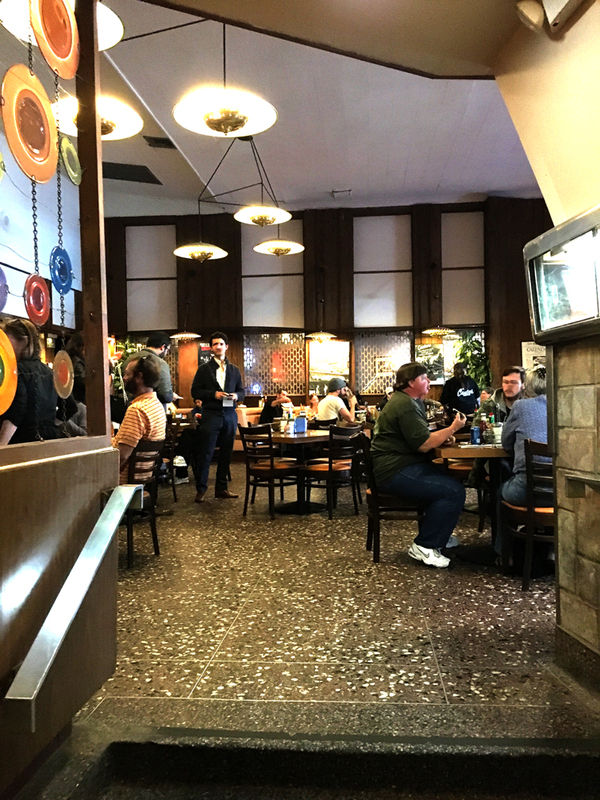 Canter’s first location was in Boyle Heights (in downtown LA) in 1931; it opened in this location on Fairfax (in Hollywood) in 1953. Often this blog takes me to new and wonderful places, but sometimes it’s about re-visiting places I’ve been a million times. 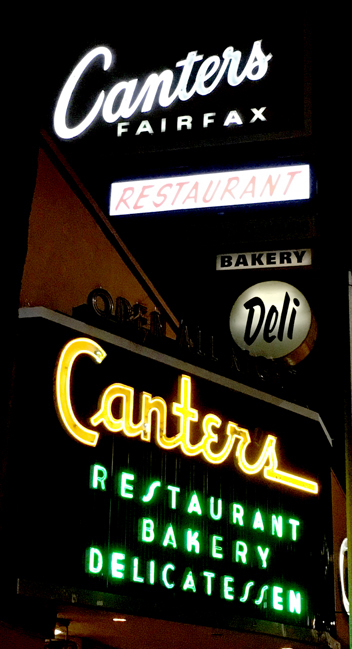 I lived down the street from Canter’s Deli when I first moved to L.A. I was living in a tiny apartment with a couple other punk rockers, and we had almost no money and went to clubs every night, and if we happened to not be completely broke we’d go to Canter’s afterwards, because it was open all night and they were nice to us and you could get really full for super cheap, if you like eating pickles. We were very hungry so we liked eating pickles. 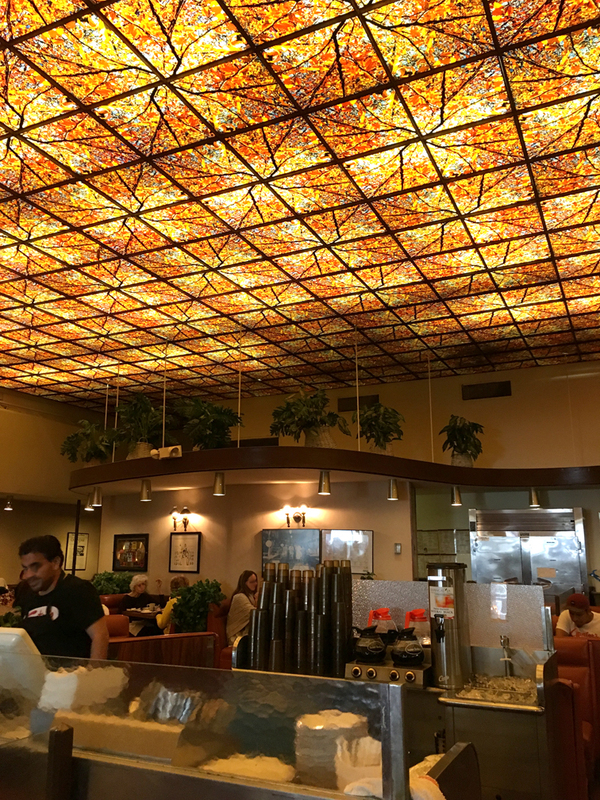 I’ve gone to Canter’s fairly regularly since. I saw Liza Minnelli there once (I was certain it was her and my friend was certain it was not… and then the waiter came over and quietly freaked out because OMG it’s LIZA!!) and I’m pretty sure the last dinner I had with my dear friend Marcia Wallace was at Canter’s. David (my husband) has been going to Canter’s all his life; with his grandfather when he was a tiny child and then every day before school all through junior high and high school. He and a group of his school friends still meet there almost every week. At least one of the waitresses remembers them from when they were thirteen, and you can tell she doesn’t trust them not to throw stuff as soon as her back is turned. 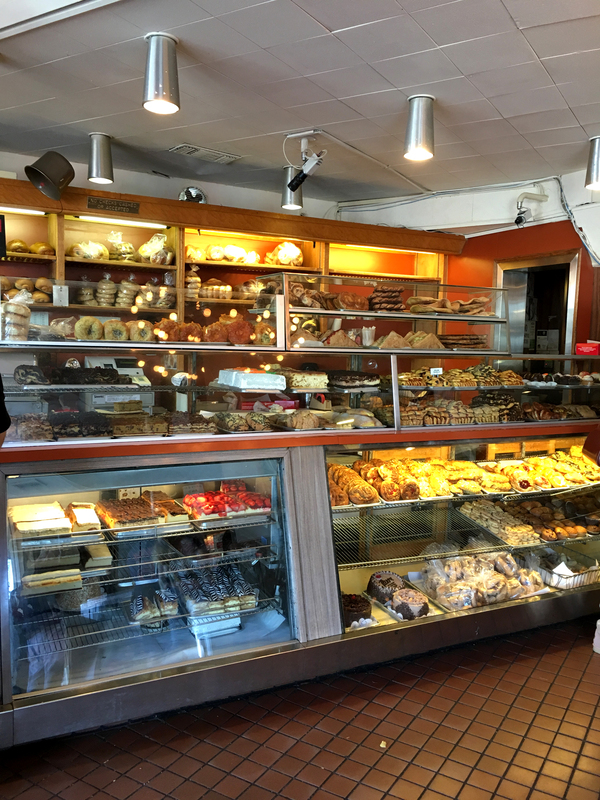 -The doors open into a sort of entryway with a large take-away deli counter on either side, one with soups and sandwiches and the other with cookies and cakes and all sorts of pastries. 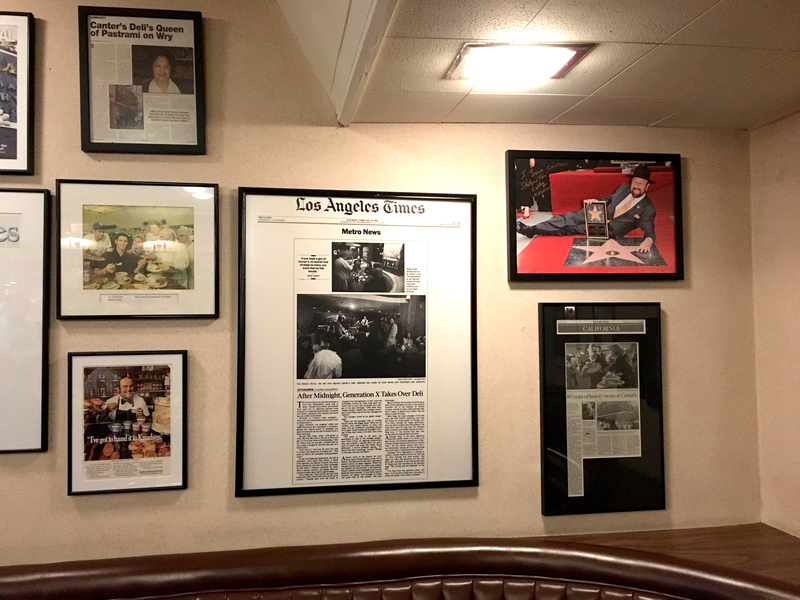 Every walls is covered in framed news articles about the deli and signs and pictures of the deli and people at the deli and all sorts of things. Once you get past the deli counters, and the register, and the “please wait to be seated” sign that nearly always has people waiting at it, there’s a jumble of orange and brown booths set higgledy-piggledy, separated with frosted glass panels, with round booths lining the walls. The odd angle at which they’re arranged seems chaotic but in a really nice way. It adds to the bustle of the place. The ceiling is low and plain white at first, but then opens up into one of those fake ceilings that looks like a sky light, with autumn trees above. Those are fairly common now, but I’m pretty sure the first one I ever saw was at Canter’s, and maybe that’s why I find the effect so lovely. 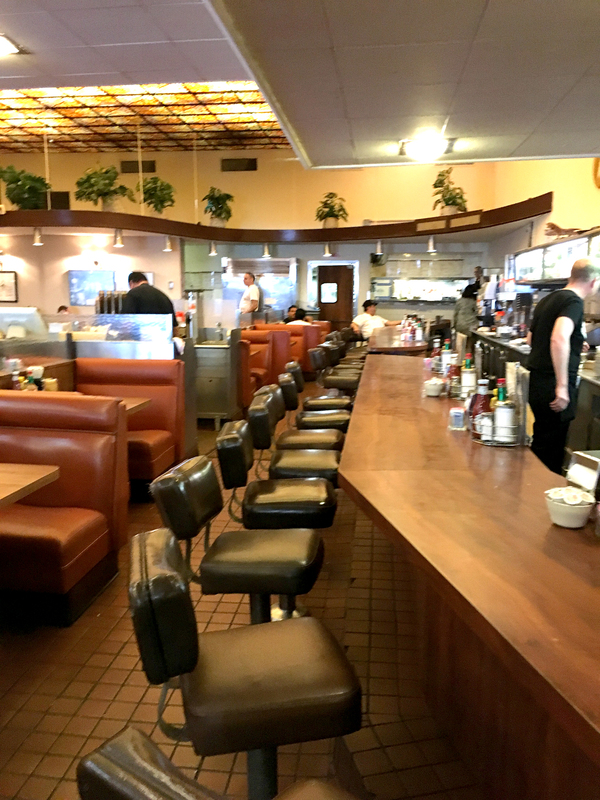 There is a long formica counter towards the back, with brown seats, and next to it a row of smaller, two-person booths. The restrooms are up a flight of twisty stairs in the corner. The stairs lead to a landing where the walls are covered in articles about Canter’s, blown up to mega-size. The article from the “Park La Brea News” newsletter is just as large and well-framed as the article from Rolling Stone magazine. To the side of the main room is a set of steps leading to another large room, also lined with booths but with a lot of tables and chairs in the middle, and everything a lighter color than the booths and tables in the main room. It feels much less crowded than the main room and also has a sort of tacked-on feeling to it. I saw in one of the articles on the walls that it was added later. It isn’t a bad room, it just has an oddly different feel. More like a standard diner than a bustling deli. On the other side of that room is a bar called the Kibitz Room. I used to have a friend who DJ’d there fairly regularly. -I got a bagel with cream cheese — I asked if they had light cream cheese but they were out so I was forced to eat the much more delicious regular cream cheese — and bacon, and a fruit cup. Once when I was waiting for friends by the entrance I read an article that had been framed and hung on the wall, about how Canter’s had the best fruit cups in the world. So I ordered them and it’s true — every single piece of fruit is like the one really good piece of fruit you get in a normal fruit cup at a diner. -The hostess who seated me looked exactly like the type of lady you wouldn’t expect to have a tattoo, but she had a tattoo of a very realistic eye on her back, just under her neck. Her shirt hung a little low in the back so you could see it. I wonder if she got it because so many people walk behind her, day after day, when she takes them to their tables. -I checked, as I always do, to see if there was free wifi. Turns out there is, but only if you “check in” on Facebook. I think that’s a brilliant idea, because of course having people check in is good advertising and lots of people are going to want to use the wifi… But I decided I’d only do it if I really, really needed to. I hate checking in places, especially if I’m eating alone with a book. There’s always that threat that a friend will say “Oh, hey, I’m near there! And hungry! I’ll join her!” and truly, it doesn’t matter how much I might like the person: if I’m eating somewhere with a book it’s almost always because I want to sit there and read my book. Also, you never know when someone might have sent an assassin after you and sure if they’re any good they’ll find you anyway but even so, why advertise your location? -On the wall behind the counter are two signs, both printed on 8×11 paper and put up with tape, about water. One says, “Do NOT serve water to any customer until you ask if the customer wants water or the customer asks for water.” Then, directly beneath it, another sign that says “WATER SERVED ON REQUEST ONLY.” I feel like one of those signs was posted and then the other one was posted when no one paid any attention to the first one. But I don’t know which was first. -There is a cocktail on the menu called “Canter’s Pickle-Infused Bloody.” I thought that would just be a Bloody Mary with pickle juice in it, but no, it’s a regular bloody mary with vodka that is “pickle-infused.” I have no idea what that means but I don’t drink alcohol anyway. -Above the counter on a ledge there is a display of Dr. Brown’s sodas and, mysteriously, a small china figurine of an angry tiger. -A guy walked by wearing one of those “ugly Christmas sweaters” that are all the rage now. I remember years ago when people were first having Ugly Christmas Sweater parties, and a friend complained that it was suddenly hard to find really ugly old Christmas sweaters in thrift stores, because everyone was buying them up, and I thought it was a cute silly idea. But now they’re actually being manufactured on purpose to be ugly, plus I saw an “ugly sweater kit” at Barnes & Noble, and I don’t know, I think that sort of kills it. 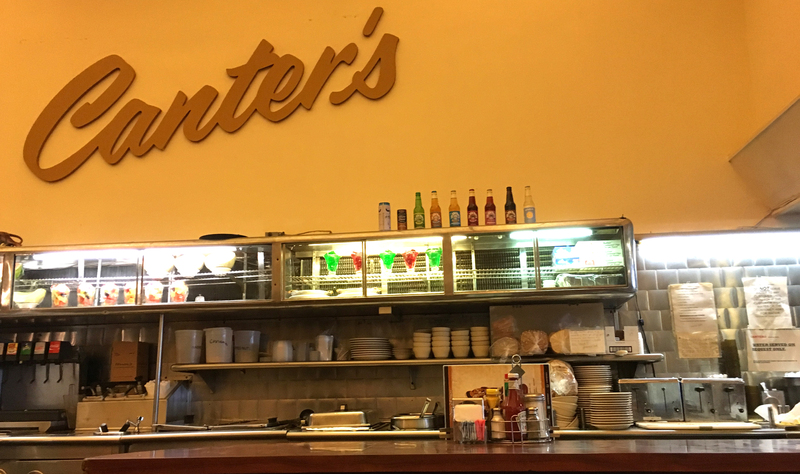 -There are many photographs of Canter’s in days past, all over the walls, and the best part is that nearly all of them are dated so you know exactly what time period you’re looking at. It is astounding how many restaurants put up pictures of the old days and give no indication of when the picture was taken. -The woman in the booth two over from mine talked on the phone almost the entire time she was there. The way she was hunched over and glancing around covertly as she talked made it seem like she was definitely a spy, except her voice was way, way too loud for her to be a spy. Unless all that stuff about what drinks she preferred at Starbucks and how annoying it was when her cat didn’t use the kitty litter was code. It could have been code. -The lamp shade over the stairs leading up to the bathrooms has band stickers on it. This is remarkable only because it’s very, very high up. It doesn’t seem like many people could reach it to put on stickers. Maybe it was just one very tall guitarist, who changed bands a lot over the years? -In the bathroom stall is one of those cases that holds the paper seat covers, like you see in most public bathrooms. This one, I happened to notice, has “Rest Assured” written on it, with one of those tiny circle R symbols that mean we better not steal the name. I don’t want to steal the name and I’m not much for bathroom humor, but I did enjoy thinking about how pleased the person who came up with “Rest Assured” must have been. They probably told their spouse as soon as they got home. “Honey, listen to this!” they probably said. -A woman walked by me who looked so much like Kim Novak in “Bell, Book, and Candle” that just for a second I got very excited thinking it was Kim Novak, but then I remembered that Kim Novak is very old and possibly also dead. I looked it up and she is not dead, but is quite old. The woman was awfully pretty though, and maybe also famous. She had that “I’m famous” air, but I was too busy thinking about Kim Novak to figure out who she might be. -The guys behind the serving area, where they get the silverware and fill water glasses and all, were laughing a lot. I like eating in places that seem like fun places to work. -There used to be phones at every booth, that the diners could make calls with. This was back before cell phones. I suppose no one would use them now but I wish they still had them. It would make me want to call people, I think, if I had a phone in the booth. Other than my own cell phone, I mean, which, okay, I did have in the booth. Really it’s just that I enjoy thinking about movie stars in the fifties, getting such a kick out of calling one another from their booths at Canter’s. Maybe Kim Novak sat at my very booth and called someone. Maybe. You don’t know. Or Janis Joplin. She is another person who might very well have called someone, while sitting in that same booth. -One of the big booths against the wall, I’ve been told by David (my husband), is specially reserved for a famous LA radio DJ named Rodney Bingenheimer, who comes in almost every night. I don’t think I’ve ever seen him, except maybe I did and just didn’t recognize him because I don’t know what DJs look like. -A waiter walked by me carrying three giant bags of freshly-made bagel chips. He asked the waitress behind the counter if she needed a bagel bag but no, she already had two. -A guy sat down in the booth right next to mine, facing me, and was also making notes in a little notebook. He kept chewing very thoughtfully before writing anything down. It’s possible he was writing a review of the restaurant for his blog, which is probably called “Deli Delights!” or something. Or maybe not. Maybe chewing just helps him figure out what to write. -On the wall by the Kibitz bar is a frame with some copies of Hullabaloo Magazine, which changed its name to Circus in 1969, and under it a block of text talking about the sixties and how all the hippies would hang out at Canter’s. It’s very easy to imagine them, eating all the pastries and calling for more bagel chips. -Guns N’ Roses used to hang out here. Like, all the time, before they were really big and then also when they were really big. Someone wrote a book about it, and the book is for sale by the register. It looks like it would be very interesting but I’ve never gotten around to buying it. -I’d offered to sit at the counter when I first came in, because they were pretty crowded, but the hostess sat me in one of the smaller booths anyway. And then, when I was done eating, the waitress (who kept calling me honey which was very sweet especially since she was at least a decade younger than me) gave me the check but told me very firmly that I didn’t need to hurry, that I could sit there with my book for as long as I liked. She even offered to refill my water, clearly to prove she wasn’t making it up that I didn’t need to leave right away. It was nice of her, and fit the feel of the place exactly — that sort of “we’re too busy to stop and talk but so glad you’re here please be comfortable and have a lovely time what can we do to make it even better!” ambiance permeates the place. What I Read While I Ate: Tale of Time City by Diana Wynne Jones, one of my all-time favorites that I’ve read again and again and will never tire of. This girl, see, she’s being evacuated from London during World War II, but then she gets kidnapped by these two kids and taken to Time City, which exists outside time, and she has to pretend to be their long-lost cousin so she doesn’t get in trouble for being there, and they keep traveling around in time… It’s WONDERFUL. What Sort of Ghost I’d Expect to Find if I Believed in Ghosts Which I do Not: A small group of old men, who used to take their children to Canter’s and then later their grandchildren, and who still like to sit and talk and argue for hours and watch the people go by and smell the pickles. I think one of the sides of Canter used to be Schwartz’s Deli, before Canters moved in. 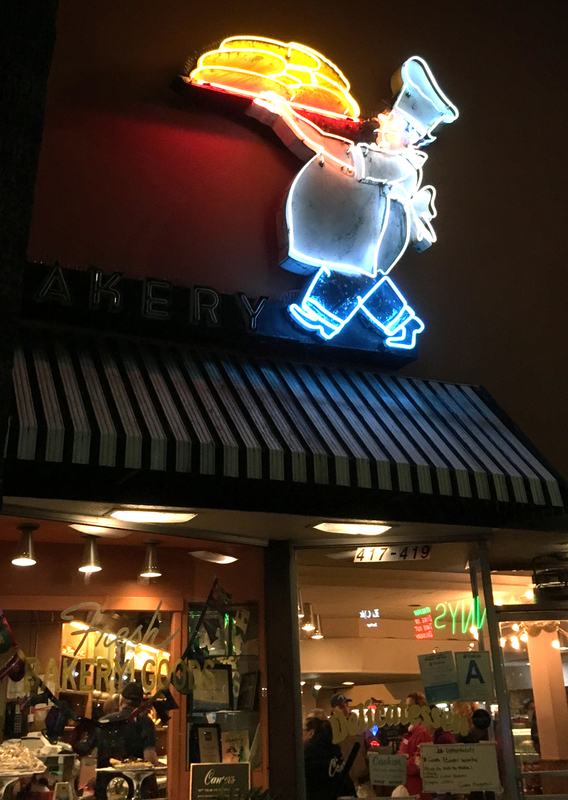 Schwartz’s bakery is now down the street.